Superb hand colored map of northern Canada depicting Nouvelle-Bretagne. 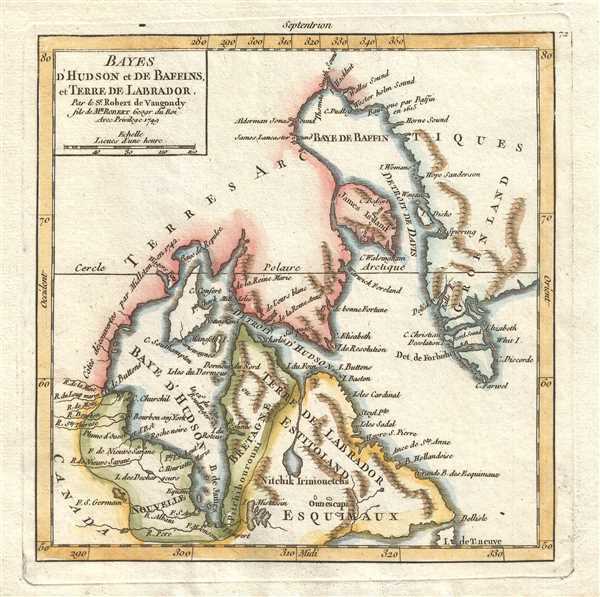 Bayes d'Hudson et de Baffins, et Terre de Labrador. Par le Sr. Robert de Vaugondy fils de Mr. Robert Geogr. du Roi. This is a hand colored 1749 Didier Robert de Vaugondy map of northern Canada. The map depicts from Canada and Hudson Bay to the Atlantic Ocean and Greenland and from Baffin Bay and the Arctic (Terres Arctiques) to eastern Canada, Labrador, and Newfoundland. The area around Hudson Bay and Labrador is labeled 'Nouvelle Bretagne, a less commonly used name for the region. The Polar Arctic Circle is labeled as well as Newfoundland (I. de T. neuve) and Eskimo country (Esquimaux). The coast is highlu detailed, with myriad labeled locations. Several rivers, all running into Hudson Bay, are labeled, and no settlements appear on the map. Pedley, M. S., Bel et Utile, p. 212, 461. OCLC 61563340.